Let me tell you a little story. A long time ago when my father was coaching track at Hendrix College and I was just a wee thing, there was a summer track and field program called the Cinder Kids. The name came from the red-dog cinder dust used on the track, back before there were painted lanes and such. As the coach’s kid, I had to participate. At five, hopscotch was my event, and they mysteriously didn’t include it. I was a terrible runner. Really, really terrible. Daddy didn’t let that stop him from entering me in every single event that day. I ran. I perspired. I lost. Over and over and over. My knobby legs ached and I was covered to the waist in a thin film of red-dog cinder dust. Because the officials gave out swanky medals to all first, second, and third place finishers in every event, there were a lot of kids out there swaggering around with highly decorated t-shirts. Everyone had at least one medal, but not me. Then I heard my name over the PA system. “Monda Strange, please report to the officials’ tent immediately.” I dragged my dusty, losing self to the tent and there was Daddy, smiling like a crazy man. “Hun, you go on over to the long jump pit. They’re just about to start. Hurry on, now.” And he winked. I did what I was told, but I sure didn’t want to. I slogged my five year-old, no-medal, red-dog dusty self to a long jump pit made for grown people and got in line to lose. Somewhere out in the middle of the field I heard Daddy’s ear-piercing whistle, the kind coaches can do without even using their fingers because they’re all good like that. I saw him from far away point at me, then hold up three fingers. He whistled again. It took me a minute, but I realized I was standing in the long jump line behind two other people. I was the third one entered. Shiny medals for first, second, and third place, and there were only three of us. Needless to say, I took the bronze that day. I’m telling this long-winded story to illustrate the nature of competition as it relates to the First Ever No Tellin‘ Scribble Challenge. One entry, one winner. In all probability, Cruelanimal scared off the competition with his stunning poem. It’s difficult to stand in the shadow of such fine literature. Way to clear a room, Cruelanimal, and congratulations! Don’t forget to pick up your award by right clicking on the picture, and copy/pasting it onto your own blog as proof of your creative superiority! Add it to your vita! You’d think that such a slim turnout on the first No Tellin‘ Scribble Challenge would deter me from continuing. Hell no. I’m a hopeful kind of gal and this is Spring Break. So sharpen your pencils and find some scratch paper. This week’s scribble challenge is inspired by a favorite site of mine, The Spam Haiku Archive. Go ahead, click on the link. The next time you look up, you’ll have lost three hours reading Spamku. It’s fun, it’s easy, it’s 19,000 haiku about potted meat. Writing a haiku is simple – one five-syllable line, one seven-syllable line, and another five syllable line. Three rhymeless lines. With a nod to Spamku, I challenge you all to write a haiku about Viagra. I’m serious. 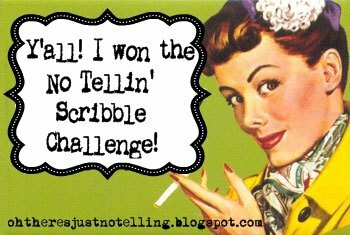 This week’s winner will, of course, earn the right to sport the No Tellin‘ Scribble Challenge badge on their blog. So enter often and don’t be too disgusting. The challenge ends Friday night, and I’ll announce the winner on Saturday. I know you want toBut I’ve got a pill to takeAnd an hour to wait.—I’ve waited so longfor a cure for my ailmentBlue’s my fav’rite now.—Before she told meI was just another fish.Now, I am a shark.—I’m an honest man.But sometimes I get reasonTo cheat a bad hand. “A 70-year-old Man Attempts a Seduction”Ed don’t need the V–Pop in a dirty movie,Turn the sheets down. Go.…but wait, y’all just wait–Ed’s losing his steam quickly.Another strike out.Back to the dugout–Water! Gatorade! The V?Hate to say told ya. Although the competition was fierce, I managed to pull it out at the buzzer with a last second three-point stanza.But let me add I was proud just to be considered for this honor — and to stand in the company of such giants. Um. Hey. <>Where is everybody?<> Is it a snow day?Good thing I didn’t submit a second poem, or I’d probably have canceled out my own chances of winning — sort of like Cate Blanchett at this year’s Academy Awards. There’s competition now! If i listen very closely I can hear all of your counting syllables on your fingers.This contest will be especially challenging for those of us from the South who consistently make two syllabic counts for every one-syllable word we say. We’re funny like that. And it’s endearing.Imagining Cruelanimal as Cate Blanchett is a little unnerving. He saved it in the end with the Lou Gehrigesque acceptance speech, though, despite his basketball references. These are killing me. More!